Quick Check makes shopping at Waitrose easy and quick and as a myWaitrose member, you won't need to register to get started. Simply scan and pack your shopping straight into your bags. You’ll see a running total of your spend and when you’ve finished, just pay and go, with no need to unpack at the checkout. Simply scan and pack your shopping straight into your bags. You’ll see a running total of your spend on the handset, plus you’ll hear a beep to alert you to special offers. When you’ve finished just pay and go, with no need to unpack at the checkout. you have trouble scanning a product, keep it to one side and declare it to a checkout assistant before you pay. Scan the ‘End your shop’ barcode at your checkout then pay for your shopping. There’s no need to unpack your bags and your myWaitrose benefits will be automatically applied. You need to scan every item before placing it into your bag, including products on promotion such as Buy One Get One Free. (Please note that some promotions will not register on the handset but will be applied when you checkout). If you have any trouble scanning an item, keep it separate in your trolley and declare it to the assistant at the checkout before you pay. Weigh items Some fruit and vegetables need to be weighed. Place your product on the scales in the aisle and follow instructions to obtain a barcode. Loose items Some individual fruit, vegetables and bakery items don’t have a barcode on the product. Use the ‘Scan Me’ barcode on the edge of the shelf. Security tags Scan the item and keep it separate in your trolley. Declare the item to an assistant at the checkout to have the tag removed. will assist you with this process. Simply visit the Welcome Desk. 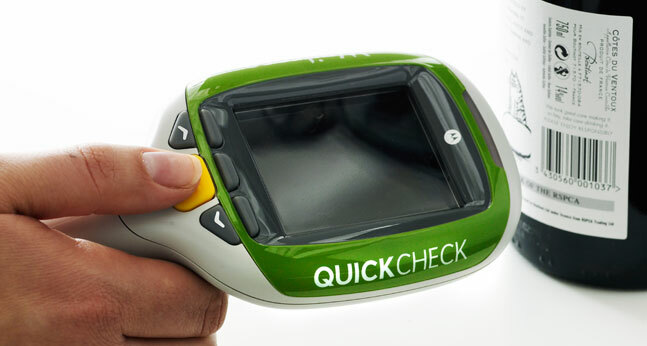 We’ll happily show you how to use Quick Check. By using Quick Check, you agree to these Terms & Conditions.